Terminal 1 of the San Francisco International Airport is undergoing some major construction just in front of our Reading Room. We are still welcoming visitors and window readers, although we are less visible behind the construction site. But our staff is reporting wonderful fruitage amidst the challenges of noise and limited access. One attendant commented that she had more thoughtful visitors who stayed longer and asked deeper questions than usual. One construction worker constructing a troublesome portion of the “great wall” in front of our door was troubled by withdrawal and the loss of his family. I said, “You are in the right place!” I told him that God would do it all and he could not be deprived of anything that was rightfully his. I gave him a keychain I took off my Reading Room key with the words, “All things are possible with God.” The wall went up very quickly. A visitor found us while reading the departure/arrivals board that is fairly close to the Reading Room. He asked what we were, and could he look around and read. After 15 or 20 minutes he came out and asked if he could have the Christian Science Sentinel he held up, and please where could he find a church? I said yes and gave him a old Christian Science Journal, with its directory, and he thanked me profusely and knew exactly why he came here. One attendant reported that as she was arriving to serve at the Reading Room at the San Francisco Airport, she heard extremely loud noises coming from the area of the Reading Room. There she saw huge partitions that clearly separated the reading room from most of the terminal. The area was being completely renovated. The picture was disturbing in that it seemed that few people could see the Reading Room much less want to visit us. She saw the need to correct her thought. “God did not take a vacation. He is closer than the air we breathe, supporting us and making sure that the Reading Room is visible to all who have need of it.” The instant these thoughts came to her, a man walked in and purchased a very expensive Bible: A proof that the Reading Room is as visible as our open, loving, and inviting thought. A young woman from Toronto came in and wanted to know what our Reading Room was. The attendant shared a little of Mary Baker Eddy’s life and her discovery of how Jesus healed, and the healing book she wrote. Then she was told when Mrs. Eddy started her church, she started a publishing society to publish her works, and instituted the Reading Rooms to sell her works. She readily purchased Science and Health with Key to the Scriptures. She was shown the listings of Toronto churches and Reading Rooms in the Journal and was given a Journal, a Sentinel and a Christian Science Monitor. She was very grateful to learn of Christian Science. 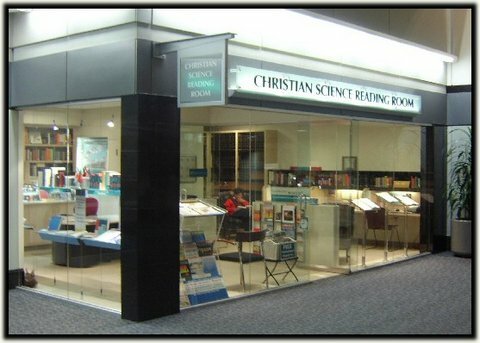 One of our attendants reported that he took a call from the UK, from a woman who called our Reading Room because it was too late for her to call a Christian Science practitioner in the UK. It would have been 2 or 3 a.m. there. She complained of a lot of pain, and said that she had been working with a practitioner and reading page 475 of Science and Health with Key to the Scriptures, which page presents the definition of Man. The attendant led her to the next page, 476, and had her continue reading to line 32, wherein she read that “Jesus beheld in Science the perfect man, who appeared to him where sinning mortal man appears to mortals. In this perfect man the Saviour saw God’s own likeness, and this correct view of man healed the sick.” The woman was wonderfully relieved and grateful to the attendant and to our Reading Room. A young local man came into the Reading Room while waiting for his girlfriend’s arrival. I inquired if he was a Christian. He was amused at the question, and smiling he replied, “I’m a pagan.” Instead of sharing the basics of Christian Science as I generally do, I shared healing testimonies from my own experience and of those in my family and explained each one. This young man was amazed that such healings are taking place in the world today. By the third testimony, he had already purchased Science and Health. He was receptive to all he had heard, and I thought as he left, there goes one less pagan.